Newborn photography sessions are like no other photography session. In order to have them flow smoothly and to obtain those stunning images, a little preparation is required from both myself as the photographer, and you as the parent, and this begins as soon as your session is booked. Below are some frequently asked questions and some handy tips on how to get the best out of your newborn session and what you can expect on the day. I recommend that you book your newborn session as early as possible to avoid any disappointment with lack of availability, as I have to limit bookings due to the unpredictability of newborn arrivals. Early Booking Discounts are available for sessions booked more than 3 calendar months in advance. What happens if my baby is born early or late? As soon as you book, a date will be provisionally held based upon your due date. This just allows me to monitor my availability. Then when your little one arrives, get in touch as early as possible. Once your precious bundle is here, we can adjust and finalise the date of the session. If you did not know the gender of baby beforehand, be sure to let me know, as well as their birth weight, so that we can plan suitable colours and props. Once a booking is taken, your session is guaranteed regardless of when they arrive. The session is best to take place before your baby is 21 days old, and ideally between 5-14 days old. But why? This type of shoot requires the baby to be super sleepy and after 14 days, your baby will already be far more wakeful and it’s harder to get baby into that deep sleep that is needed to move them safely from pose to pose. When your baby is born they are used to curling up in the womb. Before they reach two weeks old their cartilage remains soft and they are still able to (and love to) get back into these curled up positions that they will be photographed in. Newborn acne also tends to appear at about 14 days old, and, whilst blemishes will be removed upon editing, having the session before this time allows for less re-touching of the images. Newborns are taken up to a maximum of 8 weeks old, but the younger you can get in the better. 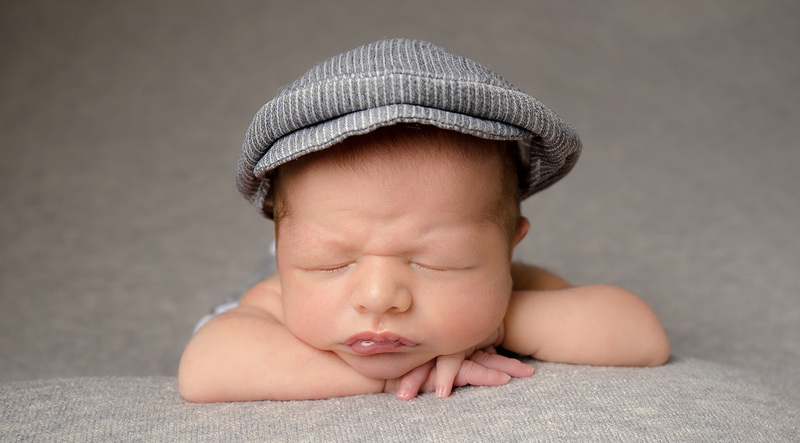 Please be aware that after 3 weeks old your session is more likely to have a mix of unposed and awake images, but will most likely include some sleepy newborn poses too. Every baby is different and the images achieved depends on how sleepy your baby is on the day. I have had some 5 and 6 week olds sleep harder than some 5 day olds so please do not think you have missed out on beautiful images of your new baby. Sessions can either take place in the comfort of your own home, or at my home studio. I can set up in any room with enough floor space for my beanbag or backdrops. A good spot can be found in almost any home. If furniture needs moving to allow for set up, I can do this once I’m there, and don’t worry, and I’ll put it all back before I go. Why does the room need to be so warm at my newborn session? Your new baby has just come out from a warm a cosy environment. They will be naked, or dressed in little outfits that do not provide much warmth so in order to stop them getting cold I heat up the room. This also helps them stay beautifully sleepy. I try to heat to approximately 27 degrees. I will be bringing with me a space heater encase the temperature of your house needs a little boost, and to ensure that it is maintained throughout the session. As a general rule, if we adults aren’t feeling hot, it’s not hot enough! I also suggest you dress according to this temperature to make sure you are as comfortable as possible and you don’t overheat. If you need to step outside to cool down now and then that’s fine. Newborns are unable to regulate their body temperature so I will constantly we watching your little one to ensure they do not overheat. Expect the session to take between 2-4 hours. The length of session is dependent on how settled the baby is, rather than how many photos I take. I do the same amount of sets up, regardless of how long the session takes. We will be following the baby’s lead entirely as to how quickly we can transition from pose to pose, and how much feeding, changing or cuddling they require. Don’t worry if your baby isn’t settling. It is very very unlikely that we won’t end getting any images at all, even if they are colicky or a little bit poorly on the day of the session. Is there anything I need to do before my newborn session? If possible, try to keep your baby awake for about half an hour prior to my arrival. I realise this might be sooooo hard to do, especially at this young age. I know from my own experience of doing this for my own baby’s newborn shoot. In fact at the time I swore that the easiest way to make a baby sleep, was to try and keep them awake! But if you can, it’ll be worth it, as they will be that much sleepier for the session and it will go much smoother. A bath and some play time often helps. Full tummy = happy baby. Ideally you will feed the baby as soon as I arrive and while I am setting up, which will allow me to commence photographing as soon as my stuff is ready. If possible try to time it so that you won’t have fed for a couple of hours beforehand, so that baby is hungry and wanting that feed. If you’re coming to me, you can feed your baby just before you leave. Having said that, who has a feeding schedule at less than two weeks old??? I know my children didn’t! Most likely you are feeding on demand at this stage, so please take the above as best case scenario, and do not fret if this doesn’t work out on the morning. All it will mean is that the session may take a bit longer, but that’s fine. That is why we allow for such a long shoot. Your baby will be leading this session and we will go at their pace, stopping as much as they need to for feeding and settling. What happens if my baby goes to toilet when their nappy is off? Expect you baby to go to toilet! They will have their nappy off for a lot of the time, so it’s more a case of not if they go, but when and how many times. Please don’t be embarrassed if they go over my equipment….or me. We will simply clean up baby and move on to the next pose. All equipment is thoroughly cleaned before and after each shoot. I am more than happy to take some shots of the baby with parents and siblings, in fact I recommend it. Whilst the shots of baby curled cutely in a basket, or sleeping soundly on the beanbag are truly beautiful, you only fully appreciate how tiny they are when you see them up against someone else. I appreciate you’ve just had a baby and may not be feeling your best, but I urge you to consider being photographed with your baby. It’s better after all to have them taken and choose not to buy the images, than regret not having them taken later on. I only take upper body shots so you need not worry about your tummy which will likely still be swollen at this time, and I can always edit out any bags from under your eyes! All outfits for the baby are provided. When I arrive, before you start to feed, I will ask you undress the baby into just their nappy and to untack the nappy so that it is loose on the baby. This allows for any red marks that the nappy leaves to fade and means we don’t have to disturb them once they are fed and sleepy in order to undress them. Have a blanket or two to hand to wrap them in and keep them cosy until we are ready. I suggest plain clothing with no bold patterns or prints and no logos or slogans. You will be looking at these images for years to come so picking something simple will mean you don’t risk looking back and think “why on earth did I wear that”. Younger children can be bare chested, or girls, covered by one of my wraps. Dads may also be bare chested if they feel comfortable. Newborns love skin to skin and it makes for a beautiful image. What happens if my baby will not settle? Don’t worry if your baby isn’t settling. It is very very unlikely that we won’t end getting any images at all. I have lots of tricks up my sleeve to settle your baby. Will they cry? Babies cry for all sorts of reasons so it’s possible, but usually for a matter of moments. I am very good at reading their signals and often if they cry at all, its a quick telling me off from moving them out of a position they were comfortable in. I have a 3 attempt rule for a pose so if your baby does not like a particular pose we move on to the next one. I do not distress the baby for the sake of a photo. Despite in all my years not needing to do so; If for what ever reason your baby does not settle, perhaps they are feeling a little colicy or unwell. If no matter what we try we haven’t managed to obtain enough images for your gallery, we will re-schedule for another day.